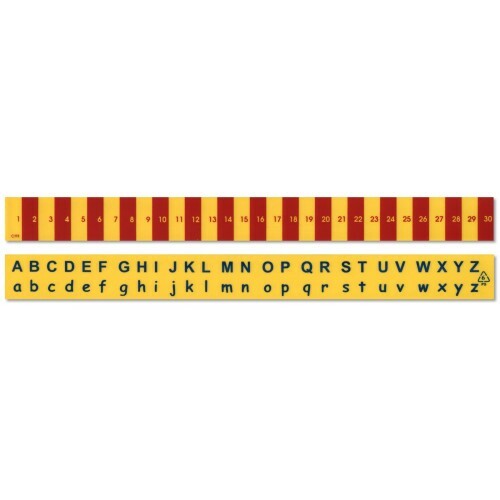 Combine two of the most essential learning tools together with the help of our Recycled Plastic Alphabet Ruler. This unique design has been inspired by the youngest children in education; those who are on the journey to learning both their letters and numbers all in one. It has been manufactured from a strong, durable and hardwearing recycled plastic. This not only provides the reliability needed to withstand use by heavy-handed children but also allows it to be recycled once again at the end of its life. To capture and keep their short attention, the ruler has been patterned in a bright yellow colour with thick red stripes across one side. The design is both aesthetically pleasing and effective, providing a clear visual tool for distinguishing between each centimetre marker. On one side, the ruler can be used to measure numerical increments clearly. On the other, the letters of the alphabet have been printed in both upper and lower case and using a starkly contrasting black ink. Regardless of what class they're in at any given time, this affords them the chance to practice letter recognition, measurement skills and general use of a ruler at any given time. In turn, it becomes one of those items in their school bag that consistently offers a learning opportunity throughout the day. We offer discounts for bulk purchase including an individual unit price of £0.48 for orders of 10 or more or £0.36 for orders of 100 or more.